First of all, let me tell you that even though the word polyglot sounds a bit intimidating, it only refers to the people who speak more than one language. Q: Are you an expert linguist or what? Why should I take your advice? You’re 16! A: I’m not an expert linguist and I don’t pretend to be. I just happen to like languages a lot and to be very fast at picking them up. I just thought I could share a few (lengthy) tips that have helped me learn English, French and now Swahili. Q: Can’t I just wait until the whole world speaks English? A: You can, but you don’t know what you’re missing! For example, I’ve been told I have a clear writing style -in all the languages I speak. I was not born with this ability, it comes from learning languages! Q: How long will it take to be fluent? A: It depends on the frequency and efficiency of your studies. However, if you are not able to carry a conversation with ease or understand a complex text within half a year, you are not learning the language properly. The time it takes to achieve fluency is greatly reduced by the number of languages you already speak. Also, the standard of fluency varies from country to country. If you’re learning an European language, it’s usually very high. Q: Will I look stupid when speaking a foreign language? A: At first, yes. You’ll express yourself like a 5-year-older (one that doesn’t have a potato in his mouth, if you’re good). Resistance is futile. Prepare to be humiliated. But then it gets better. Q: Will I mix up the languages? A: If you’re not very bright, perhaps. Otherwise, it is very easy to keep your head thinking in one language at a time and your mouth behaving accordingly. You will do this voluntarily at first by need, and that’s OK to some extent (“A qué hora quedamos en… la… beach”) but try not to abuse it. It is far from strange to be a polyglot: Multilingual speakers outnumber those who can only speak one language in the world. The language with more secondary speakers is French (190 million), followed by English (150 million) and Russian (128 million). The more languages you speak, the easier it is to pick up a new one. Languages all borrow from each other. It is common in Europe and India to speak three languages. It is uncommon in the US to speak more than one language (17% speak two and many of them are immigrants). Not every language is good for every person. If you plan to learn several languages but speak only one now, many recommend Esperanto as your first second language because it’s made to be simple and fast to pick up while containing elements of many languages, providing a good base for further training. It is easier to learn a language that is closely related to the ones you already speak. However, don’t make the mistake I made with Portuguese: languages that are too similar may bore you to death. Start with the same language family of your first language, but make sure that you are interested in the tongue: don’t base your choice in ease and speed of learning. If you want to live in a certain country in the future for a long period, then it’s obvious that you should have at least basic knowledge of the language (that you can start improving the moment you set foot in it’s ground). Do you enjoy reading? If you do, you must know that most of the great works of universal literature were not written originally in English, and there’s nothing like the original, right? My main inspiration to learn French were the works of Jules Verne, an writer I enjoy a thousand times more now I can read in French. Great choices are also Russian and Spanish. It’s really up to you and the kind of books you like reading (or films you like watching!). If you want what I call “a totally awesome mind-blowing language experience” (I’m not good with names), then the one to choose is one that is completely different from the one or ones you speak. For example, I speak Spanish. Then I learn French and discover the grammar and syntax are similar. Then I go to France and discover that the people and customs are similar. Not the same, obviously, but still similar. But then I start learning Swahili and it takes me a week to start finding resemblances to Spanish. The way Swahili is structured, it makes me think very differently than in English or Spanish. In different languages you can think and express concepts you may not be able to in your first. I recommend a couple hours in Wikipedia checking out exotic languages – you’ll be fascinated! Lastly, a good guide to pick a language is your career and your interests. For example, I want to be an archaeologist and I am fascinated by ancient Egypt and Greece, so I assume I will be learning Egyptian and Greek at some point of my life. It may not be so obvious for professions that involve less travelling and history, but I’m sure you can find a way a language can help you be better at what you do best. Philosophers and psychologists I know are fans of Greek and German. If the language you want to learn uses a different alphabet, by all means learn the language in that alphabet from the beginning. Don’t use some wishy-washy adaptations. You’ll regret. Same way a lot of bricks are not a house, a lot of words are not a language. The first thing you want to know is the basic structure of the language: what the morphemes are and how they are put together to make words, and what the word classes are and how they are put together to make sentences. I’m not saying you must master Russian grammar the first day, I’m saying that you must not begin by learning random words (the colours, the verb to be, some animals…) because you will forget it all the second week. You must have something to which to stick the words you learn from the very beginning. There’s a wonderful book on this topic, The Loom of Language, which you should read if you are serious about the subject matter. You will discover that learning the grammar of a second language will improve your use and knowledge of your beloved mother tongue. Same way, the more you know about said tongue’s grammar, the better equipped you are to learn new ones. Another very important thing is to learn to respect the language. This is, accept that when you’re speaking Arabic you are speaking Arabic, and not translating English into Arabic. Every other language is not a translation of your mother tongue – they are individual languages that deserve respect. Don’t phrase in English and then translate -even from the very beginning- but give the other language a chance to be the the one in which you think to being with. The idea is to combine some or all of the following as it best suits you. Of course, you can also sign up for a class, but I don’t like schedules. It’s better to go at your own pace. Travelling: This one seems to be the fastest and the one that deliver bests results. When you are surrounded by people who don’t speak what you speak, you will need to pick up their language fast. Need is the mother of invention, you know. Speaking Online: If travelling is not an option at the moment, the best you can do is pick a webcam and a mic and start contacting people who speak the language you are learning. You can also use written IM or emails. Make sure to contact only people with whom you wish to begin a friendship of at least become acquainted, though. Don’t use people just to practise a language – that’s just plain mean and disrespectful. Thought Method: Try to think on the new language and only in that language for a few hours a day. Perhaps just lay on your bed and start thinking about your day or your year. It’s faster than writing it all down, and the continuous flow of ideas will help you phrase concepts fast. It makes you feel the language as yours. Input Method: Watch films, read books, read poetry, listen to music. A LOT. I learnt English mostly by input method. It’s main advantage is that you are given a lot of different situations and are getting the language at it’s full (some native speakers will dumb and slow down their speech so that you can understand them better). You are also getting to know the culture of the country or countries by the way they express themselves through literature and music, and it’s a highly enjoyable system. You can read out loud to practise pronunciation, but only if you are sure you know the proper sounds. Creation Method: Start actually writing in the language. Songs, poetry, long letters, a journal, it doesn’t matter. Just use the language as much as you can. It works better if someone corrects it later. When we chat with friends we tend not to respect grammar very much. It is not good to learn a language only by using it with other people. You may learn to use it, but you will lack style and deep understanding, thus never being able to master it. Studying: You will need to study grammar when you’re starting, as stated above, and when you want to improve your skills. But you will not learn to speak a language by studying grammar only. This belief may result in the dreaded “I’ve been studying Spanish for two years” “Qué te parece España? Te gusta?” “I’ve said I’m only STUDYING!”. Think twice before buying grammar books – there are vast amounts of free information online for almost every language. If you are a fan of printed media, the Lonely Planet Phrasebooks are excellent for quick, handy reference. Just don’t spend hundreds in learning material, it’s not worth it. Woah! That was long! I shall bore you no longer 🙂 Thanks for making it all the way to the bottom, and if you live in the EU like me, please remember that there are many European Days Of Stuff such as this one (that are barely remembered outside of Brussels) that are very interesting to take into account. Do you like what you see? Then Subscribe to The Daily Adventurer by Email or Subscribe in a reader. It’s free! This is the best I can do right now. I will post an update every month so you can (I hope) see my progress. 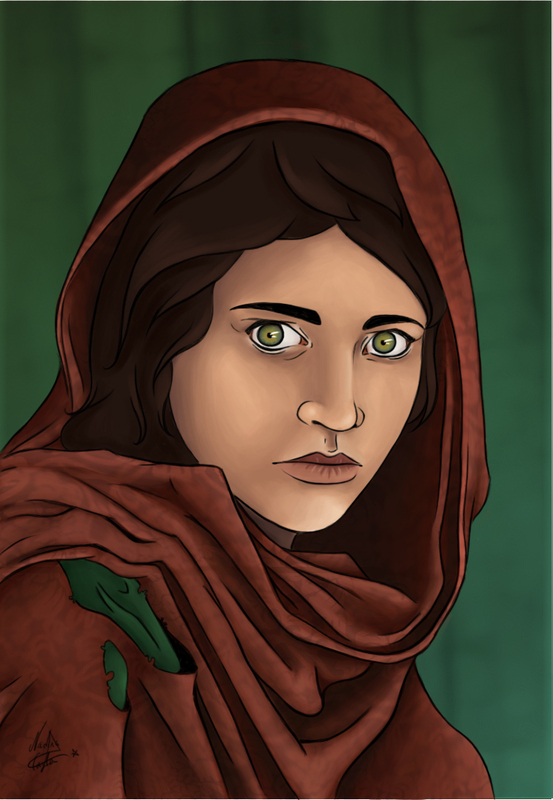 This is a digital painting version of the famous National Geographic cover by Steve McCurry.